project on a European site at the screening stage. appears the HRA may conflict with this judgement. what the timescale would be to complete and consult on that work. contact me via the Programme Officer. Shared Economic Vision for Ox-MK-Cam to be Tendered – But not Shared Planning or Transport Vision? £80,000 budget – are they serious? to drive economic growth for UK Plc. This second phase would be completed over the course of the 2018 with a view to aligning this with LIS at a place level by December 2018. With the Housing White paper and now the NPPF setting down the minimum plan making requirement for ‘strategic policies’ rather than ‘ local plan’ there has been a flurry of activity towards joint working – good oh. Examples include South Essex and South West Herts. However looking at the key decisions on some of the cases it does seem as much of an example of decisions ‘deferred’ rather than ‘decided’ in terms of the NPPF. South Essex is a good example with intervention in one case and special measures another. Will the joint strategic plan be statutory? Not clear in the recommendation – only referred to in the supporting text. If a statutory plan there needs to be an LDS amendment etc. It is possible to agree joint strategic policies through individual examinations – as per North Essex, though this is very costly and the example here would not be repeated by others studying the lack of economies of scale. What are the governance arrangements? – a joint committee avoids the deadlock of requiring unanimity. Will the Statement of Common Ground agree the minimum requirements for the new effectiveness test in the draft NPP para 36. Will strategic priorities be ‘dealt with rather than deferred’ and include the ‘strategic pattern and form’ of development’. A statement of common ground is more than a ‘memorandum of understanding’ which planning inspectors often see as an agreement to try to agree – as this one is. A Statement of common ground includes what has been agreed and what has not, so they will evolve over time as joint plans progress. This is just a motherhood statement – typical of those drafted by Chief Executives. South Essex is just at its first stage – but it clearly needs to set out what it expects to try to agree to agree anything at all. Lets have a proper architectural competition of £70 million of Treasury funding at stake. 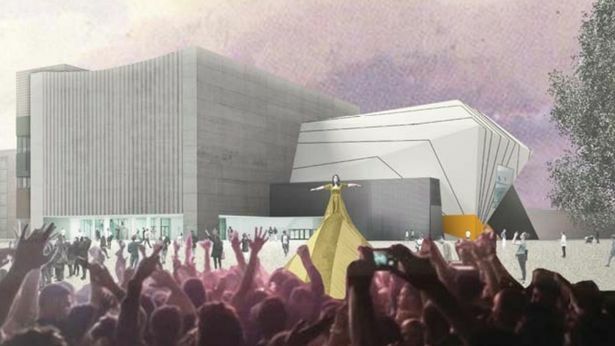 This is the first glimpse of overhauled plans for Manchester’s new £111m arts centre, dubbed the ‘Guggenheim of the North’. The Factory is set to be built on the old Granada Studios site in the city centre with the aim of becoming one of the world’s top performance venues. But, as the M.E.N. reported last July, architects were forced to go back to the drawing board – at a cost of £1.6m to the city council – after its original theatre, orchestra pit and building facade designs were found to be unsuitable. Now Rotterdam-based architecture firm OMA has submitted a revised planning application, 16 months after the original proposals were approved. The most striking change is to the exterior, with the original, complex ‘shrink wrap’ design and lift shafts axed in favour of a more ‘back-to-basics’ shape. Glass facades on the north and south of the buildings have also been replaced with concrete panels. The architect says that’s because the glass was ‘contrary to the majority of the internal use’ and would have needed to have been blacked out ‘90 per cent of the time’ during performances. Inside alterations include a reduction in the theatre’s seating capacity, from 1,600 to 1,520. The size of the orchestra pit is also set to be increased to accommodate 80 musicians, up from 60. In documents submitted with the application OMA said the reduction in seating capacity aims to provide ‘a more intimate relationship between audience and performers and a more appropriately scaled, improved theatre house’. Despite the alterations OMA insist the original ‘concept’ of the building has not changed. When its striking design was first unveiled in 2016 The Factory was dubbed the city’s answer to the New York’s Guggenheim museum. It’s intended as the city’s flagship culture venue and will become the permanent home to the Manchester International Festival. Originally earmarked to open next summer, it’s now scheduled for a September 2020 launch. 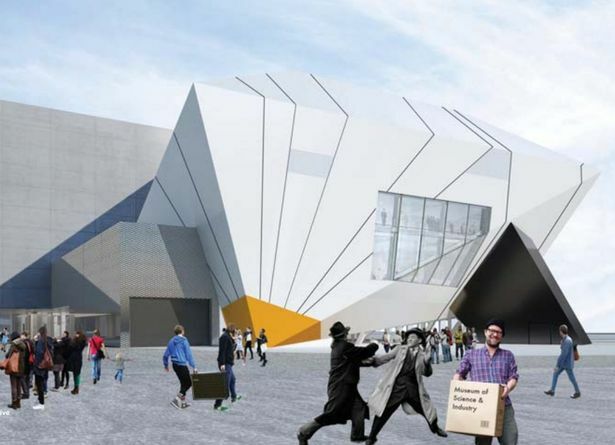 The bulk of the money – £78m – for the project is being funded by the Treasury with the remainder is due to be provided through charitable donations and the Arts Council. Employment Growth and OAN Projections – where do expect the new workers to come from? In January of this year CPRE Oxfordshire Branch wrote to all of their districts asking them to reject the Housing growth deal or the County. This might seem perverse as it would have given the large amounts of funding but asked them to build 100,000 houses for the County – exactly what the SHMA said, with no additional houses for London overspill or the ‘transformational growth’ anticipated in the NIC Ox-MK-Cam corridor report. They accused the plan as planning for commuters for London and not local need. At one level however they were right, the ‘local’ component of need in Oxfordshire is closer to 68,000 on the MHLG national OAN measure, the rest comes from employment growth, and that employment growth implies people moving from somewhere to take up the jobs. This issue is bound to get far more attention with the 2016 household forecasts, based on the 2016 based SNPPs, likely to show a major fall in population projections in Oxford Cambridge and most of the south east. ironically this is due to in large part lack of housebuilding leading to a low demographic baseline in order to project from. Hence the national method wont end at all arguments at EIPs over OAN, it will simply intensify arguments about employment growth projections, especially in areas such as the ox-MK-Cam corridor and the Northern Powerhouse with transformational growth projections. The first would have already been accounted for and will have limited potential in a tight labour market. People will undoubtedly move from the rest of the UK, but if these areas are to grow as well then they wont simply need to fill the jobs vacated plus the new jobs. The jobs vacated wont generate a need for an extra unit as one will be vacated but they will create a need for an additional in migrant that must come from somewhere. London is the power pump here with its huge overspill requirements. If London is to grow then it will need in migrants from somewhere. If all English regions are to grown and regional disparities reduce then there is only one source left, increased international in migration. This of course will then increase the demographic baseline in all areas and lead to an increasing demand in the future for overspill from London given its supply constraints. As i have suggested before we have a model from Ireland how to deal with this, consistent regional employment forecasts based on an econometric model and infrastructure backing up cities with growth potential to avoid primal city dominence. Lets do that here and prevent EiPs being held up a year with arguments shifting to employment projections. An extra 1.5 million apartments and houses must be built in Germany, says Chancellor Angela Merkel. Her commitment to alleviate rental and property price hikes and ease shortages is timed to be fulfilled by 2021…. Merkel told podcast viewers that €2 billion of her coalition’s agenda package would flow as a “massive” injection into social welfare housing projects run by Germany’s 16 federal states…. The situation in Germany’s metropolitan hubs would “hopefully relax somewhat,” she predicted. This so-called Grundsteuer C [land tax C] was applied from 1961 until 1963 but then dropped as the era of Merkel’s distant conservative predecessor Konrad Adenauer ended. ur national imagination has been shaped by our shared inheritance of natural beauty. Wordworth’s love of the Lake District, Edward Thomas’s attachment to the South Downs, R D Blackmore’s devotion to Exmoor, are all examples of breathtaking landscapes inspiring the writers who have helped define who we are. And it’s because some landscapes are so precious, so beautiful in themselves, but also so valuable environmentally – habitats for threatened wildlife and homes for endangered species – that we, as a nation, protect them in special ways. We have a network of National Parks, Areas of Outstanding Natural Beauty (AONBs) and other protected landscapes, which previous generations established for the nation as a whole. They exist for all of us. There is almost certainly a National Park within an hour of your home. And one of the things which makes them so precious is that they are living environments which not only, by law, “promote opportunities for enjoyment” for visitors but also, crucially, provide homes for the farmers who keep our countryside both productive and beautiful. Unlike the wildernesses that other nations have for their national parks, ours are working countryside. Over many generations, farmers and farming have helped shape the landscapes we love. The commoners of Dartmoor, the sheep farmers of the Lake District, the dedicated men and women who make a living in the austerely beautiful Peak District – they all help sustain some of our most iconic landscapes. Their hard work has built the dry stone walls and raised the sheep which graze on the moorland. It is thanks to them that National Parks and AONBs are both beautiful and ecologically diverse. Which is why I want to ensure we do everything we can to protect them, and enhance the environments in which they operate. In order to ensure our protected landscapes are in the best possible shape to meet future challenges I have asked the acclaimed writer Julian Glover, a passionate advocate for the countryside and a resident of one of our National Parks, to lead a review into how we can guarantee our most precious landscapes are in an even healthier condition for the next generation. The goal of Julian’s review is not to diminish their protection in any way, but to strengthen it in the face of present-day challenges. Are we properly supporting all those who live in, work in, or want to visit these magnificent places? Should we indeed be extending our areas of designated land? Could we do more to enhance our wildlife and support the recovery of natural habitats? These are among the questions Julian will ask. We put enhancing the beauty and heritage of our natural world at the heart of our 25 Year Environment Plan, for very good reasons. We know that time spent out of doors, appreciating the beauty of nature and the wonder of creation, is vital for our well-being. It improves both mental and physical health and re-connects us with the other species with whom we share this planet. But we also know that the economies and environments in our National Parks and other special landscapes are vulnerable. They need support from all of us if we’re all to have access to these amazing national assets in the future. A previous generation of enlightened politicians saw how critical access to beauty and the right to roam was to ensuring that the gifts nature can give could be enjoyed by all. Inspired by the great Liberal Sir Arthur Hobhouse, the National Parks and Access to the Countryside Act was introduced as a “recreational gift to Britain’s returning Second World War servicemen and women” to recognise, conserve and enhance access to landscapes “of national importance and quality”. I see Julian Glover’s work as in the tradition of Hobhouse – a report which will make sure our National Parks continue to flourish in the 21st century and beyond. And I want Julian explicitly to consider how we can extend and improve the protection we give to other precious landscapes. The nation is in debt to Sir Arthur and other supporters of countryside access – including The Ramblers’ Association, the YHA and the Council for the Protection of Rural England – for recognising the true worth to the public of our protected landscapes. It now falls to us to ensure that we do not just protect and preserve but enhance and extend the protection we give to our landscapes of special aesthetic and environmental value. One of the perverse features of ‘ Planning for the right homes in the right places’ is that it suggests lower housing numbers than SHMA need in places like Oxfordshire and Cambridge City that are crying out for more housing. Its a mystery but I think I figured it out. The clue is the areas in the South East in blue below are areas that have had little house building relatively and are highly constrained. Take Oxford for example which did not experience a late Victorian wave of terraced housing. This has impacts on the formula in two ways. First on the demographic base – if this is low the projection of that base is low. And as this is a household not homes requirement it will always be below need. Secondly the adjustment for affordability. The problem here it uses the whole population rather than say the lower quartile used conventionally in affordability calculations. This produces a distorted metric of affordability in these areas. In areas where low paid workers cant afford to live and have to commute in the metric produces a lowering of housing need rather than as it is an increase. An issue worsened by the fact that the method is housing led rather than the jobs led method used predominantly in SHMAS. Hence the method produces a perverse feedback loop of less and less relative amounts of housing in areas where lower paid workers can’t afford to live. Its crazy because the Mayors own plan is a busway – with tunnels in the centre – and using autonomous vehicles. This will still need dedicated corridors in Cambridge and to Cambourne and Park and Rideaeas because it will not be able to the whole rural areas. There is therefore complete alignment. 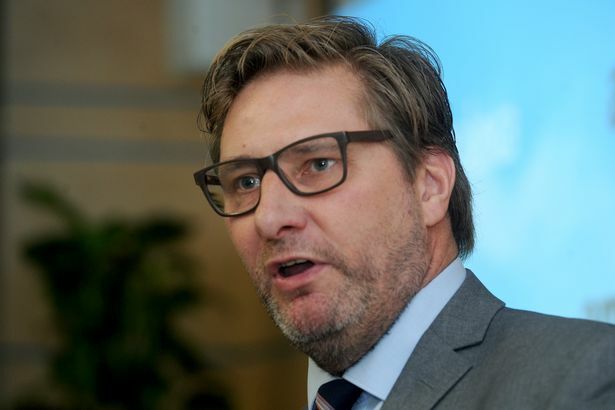 The disruptive force here against the plans worked up for years by County City, Districts and the GCP – and agreed by teh government as part of devolution deals – is Mayor Palmer. There is a relatively small lobbby against the busway just as there was before the bus way was first started and there always will be in Cambridge. The Mayor’s proposals do nothing to assuage this as his scheme will still need a dedicated corridor through West Cambridge – that is the sort of hard choice that needs to be made. The combined authority isnt working – better to do like Dorset have two unitaries for Cambridgeshire – one for Cambridge and South Cambridgeshire and the other for the Fens – simple. Cambridgeshire’s mayor has called for a halt to plans for a new city busway to ensure public money is not wasted. James Palmer warned that current proposals were incompatible with his vision for a new Cambridge metro system. The Greater Cambridge Partnership (GCP) has yet to decide on controversial plans to build a busway route between Cambridge and Cambourne. Proposals to build new park and ride sites around Cambridge are also being developed. But Mr Palmer said such work should be “paused” while his Combined Authority developed its own regional transport plan. He also criticised the GCP’s lack of progress in delivering “serious infrastructure improvements” over the past four years. The Cambridgeshire and Peterborough Combined Authority transport plan is due for completion in spring 2019. Mr Palmer said: “In the meantime it’s important to ensure that nothing is done that potentially jeopardises the ambitions of the combined authority to transform public transport infrastructure in our county. “It is therefore necessary for the GCP’s current plans to provide new busways and park and ride sites to be paused until such a time as the Combined Authority is certain that there is full alignment. 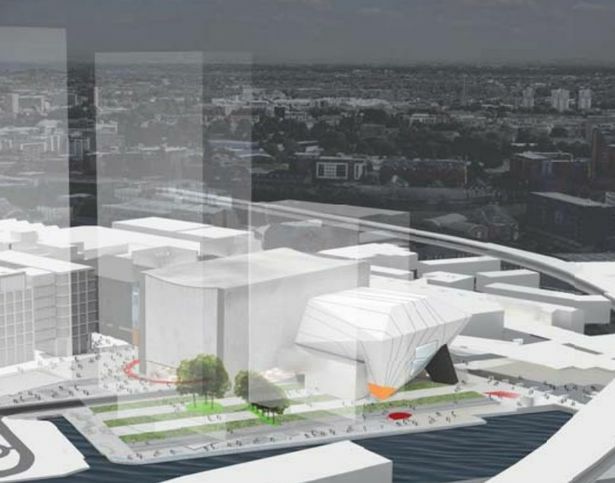 The mayor said a summer consultation would help determine where there could be alignment between the two organisations’ plans. 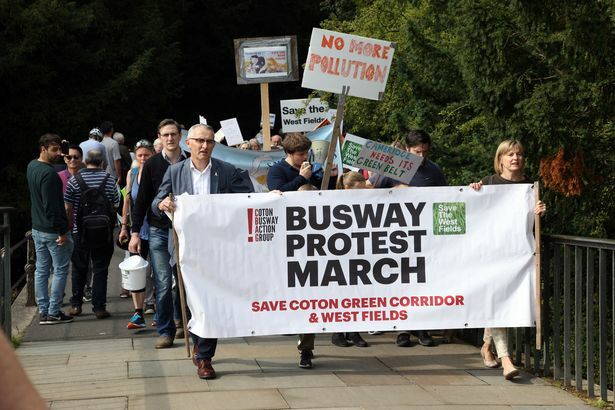 “I very much hope that much of the work so far carried out by the GCP in relation to busways can be integrated into the emerging metro proposals,” he added. “However I believe that much of what they’re proposing is incompatible with the vision for a new metro. Mr Palmer said there were significant local concerns around the GCP’s proposals and that his position was back by councillors in South Cambridgeshire. Earlier this month, Cllr Aidan Van de Weyer, the newest board member on the GCP said the Cambridge to Cambourne busway should be scrapped. In the mayor’s interim transport statement he spelled out 10 strategic transport schemes that will be taken forward by the Combined Authority. These include a new Cam Metro, an upgrade of the A10, an M11 extension, dualling the A47, a new Oxford to Cambridge expressway and another railway station to the south of Cambridge. Mr Palmer said he was developing proposals to have the new Cambridge South station built within three years and was looking at the metro proposals with similar urgency. He added: “If we’re ambitious it’s entirely possible that parts of the new system could be open within the next few years, something supported by the initial options appraisal that was jointly funded by the Combined Authority and the GCP. Mr Palmer said he had tried to build a “close working relationship” with the GCP but that the organisation had shown “little or no interest” in joint working. Responding to the mayor’s comments in a statement, the GCP Executive Board said Cambridge faced the arrival of 44,000 new jobs alongside several major housing developments by 2030. “This requires short term measures to tackle the pressing issues we face whilst working, in parallel, towards medium- and long-term ambitions,” it said. The GCP board it was working with the combined authority on schemes that provided the “building blocks” for the mayor’s transport vision. Cllr Lewis Herbert, interim chair of the GCP Executive Board and Cambridge City Council leader, said: “The Greater Cambridge Partnership now has public transport projects in development west, south east and north of the city, and is close to starting delivery on schemes that have been subject to detailed consultation and which local residents and businesses need completed for the early 2020s – rather than asking them to wait for long-term solutions which have not yet started and that are projected could take years to deliver. Cllr Herbert said the GCP Executive Board would wait for the outcome of the Combined Authority Board’s meeting on May 30 before making any further decisions on current plans. The village of Milton Malsor just south of Northampton has a unique locational advantage, as it is here that the M1, the A43, the A45, the WCMl and the WCML Northampton branch all cross. It is no surprise that the area is being eyed up for an SRFI, however two are proposed, one to the east and the other to the South of the village. The Northampton Gateway proposal now submitted, Rail Central very soon. It is obvious that the two are incompatible, and that the best site would take in some land for both with both access to the A43 and the A45 to spread traffic and reduce impact on the village. the CPO powers that go with a DCO makes that possible. Instead we are in another DCO ‘race’ as under the legislation there is no provision to examine both together and determine one and not the other. So what the final decision is before parliament and they are sovereign. If inspector at a joint hearing want to make that recommendation they’re perfectly free to.